GAZA CITY, Gaza Strip (AP) — Israeli fire killed at least 37 Palestinians during mass protests along the Gaza border on Monday, marking the deadliest day of violence there since a devastating 2014 cross-border war and casting a cloud over Israel's festive inauguration of the new U.S. Embassy in contested Jerusalem. The protests mark the culmination of a campaign, led by Hamas and fueled by despair among Gaza's 2 million people, to break the decade-old border blockade of the territory imposed by Israel and Egypt after Hamas seized control of Gaza in 2007. 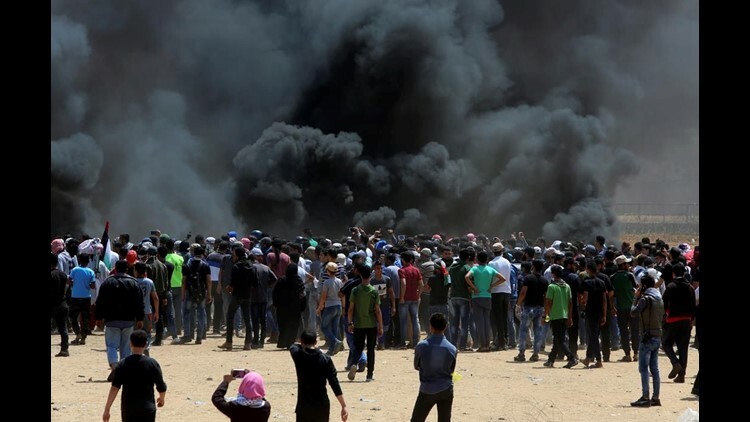 Since weekly border marches began in late March, 79 Palestinian protesters have been killed and more than 2,300 wounded by Israeli army fire. Hamas said four members, including three security men, were among the dead Monday. "Moving the U.S. Embassy to Jerusalem will be a disaster on the American administration and a black day in the history of the American people because they are partners with the occupation and its aggression against the Palestinian people," he added. Lt. Col. Jonathan Conricus, an Israeli military spokesman, said the army had set up additional "layers" of security in and around communities near the border to defend Israeli civilians. He said there already had been several "significant attempts" to break through the fence. Trump's decision to move the American embassy from Tel Aviv to Jerusalem was welcomed by Israel and condemned by the Palestinians. Palestinians seek east Jerusalem as a capital and view the Trump administration's change in policy as a blatant show of pro-Israel bias. Israeli Prime Minister Benjamin Netanyahu has repeatedly praised Trump's decision to upend decades of U.S. policy by recognizing Jerusalem as Israel's capital.